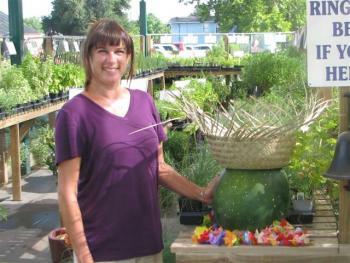 Allow Janet to introduce her new friend straight from the Arbor Gate vegetable garden! This incredible watermelon, aptly named Moon and Stars, must weigh in over 40 lbs! Handsome as it is, we can’t wait to sample this delicious summer treat. This is one of our many varieties of heirloom vegetables. Heirlooms for the fall have already arrived. See if you can’t grow your own friend!